Touted as ‘an untouched piece of art’ by Jacques Cousteau, Sipadan has greatly gained popularity as a dive destination in the past 10 years. Jacques Cousteau obviously saw what was so special about Sipadan and now many scuba divers worldwide are discovering it too. Sipadan is a small island located off the Southeast edge of the state of Sabah on the Malaysian part of the island of Borneo. It’s been fought over between Malaysia and Indonesia many times but is officially part of Malaysia. 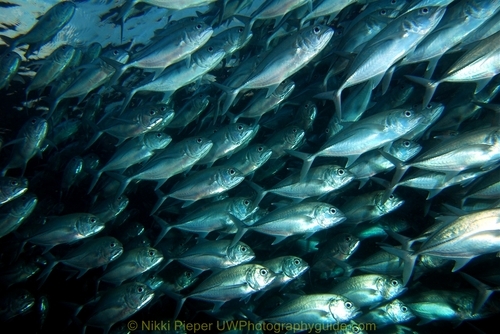 Sipadan is one of my favorite places to dive because of the sheer diversity of marine life. It is one of the most richest marine habitats in the world and has over 3000 species of fish and hundreds of coral species classified in this ecosystem. I have led groups there 5 times since 2002 and each group loved every aspect of diving there. Why? Well with the beautiful reefs teeming with life, the astounding macro subjects, the sheer walls with big animals coming by without notice, this area always seems to please many types of divers with differing interests. Sipadan is a mushroom shaped island with the bottom of Drop Off wall reaching 2000ft. The other side of the island has a wider mushrooming head below the water line with 40-60 foot reefs before sloping down to the steep walls. These are great areas to find sleeping turtles, lounging white tips reef sharks, and resting crocodile fish. The dive sites are named for the inhabitants most likely found there. You’ll see gigantic staghorn corals at Staghorn Crest, plenty of white tip sharks at White Tip Avenue, and gorgeous soft hanging corals at Hanging Gardens. You’ll see plenty of turtles at Turtle Patch as well as on every dive at Sipadan. Every sight is special, and each one is loaded with your usual schools of anthias, jacks, rock fish, trigger fish, angel fish, anemone fish, nudibranchs, lionfish, eels, octopus, etc. There’s eye candy everywhere you look. One of the most popular dive sites there would have to be Barracuda Point. Each morning you can see the chevron barracuda forming their massive spiraling schools off the reef. I’ve swam among them many times, and am always amazed at how close they let you get to them. You’ll also see schooling big-eye trevally pouring over the reef in the shallows and in the deep. The occasional tuna will swim by and we’ve seen zebra sharks, manta rays, and even a hammerhead swim by off the walls at both Barracuda Point and South Point. 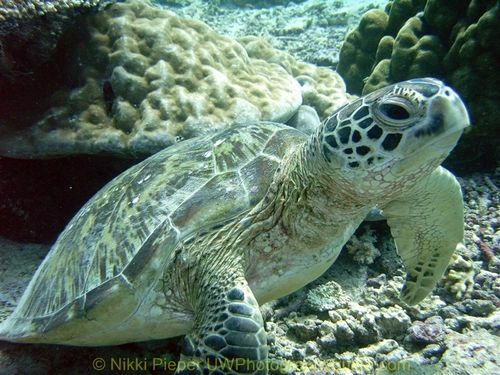 All over the island you’ll large numbers of green and hawksbill turtles. There is a turtle ranger on the island, who gathers the turtle eggs and protects them from predators until they hatch. When they hatch, the ranger releases the turtles at the shore. Once they do this, the turtles always return to the same beach when they are ready to lay their own eggs. There is only a 10% survival rate once they hit the water, but that’s obviously been enough and the rangers protecting the eggs from lizards and other predators is a great help. We were lucky enough on one of our earlier stays there (in 2005 all the resorts were moved off the island to limit the human impact on the island), to go out with the ranger after night fall, watch a turtle come in from the ocean, make sure the area was safe, dig her hole, and then lay her eggs. It was truly a ‘national geographic’ experience. A few days later we watched one of the turtle releases as they let the baby turtles crawl through the sand to the waves of the ocean. It was a magical experience. On most of my trips there, we would dive at Sipadan for 2 dives in the morning and then the Ligitan reefs, or the islands of Mabul, Siamil, and Danawan in the afternoons. 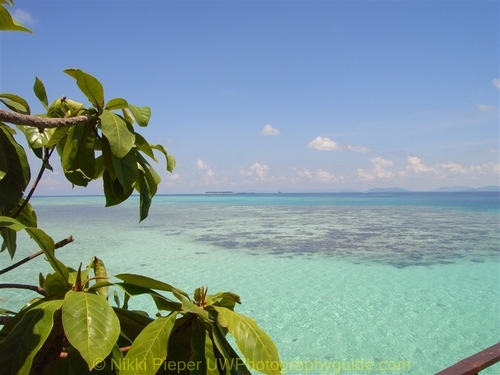 You’ll spend your surface interval between your 2 Sipadan dives on the island itself. Your resort will bring you lunch for you to enjoy and there are new restroom facilities on the island with showers. It’s a relaxing time to sit on the beach or wade in the shallow water. Your lunch will be back at your resort and you’ll head to a local reef for your afternoon dives. Lately they have been limiting the number of divers on Sipadan with permits given to the resorts. Each resort is allowed a certain number of divers to visit during their stay based on how many days they are there and how large a group is. Our last trip, we were there 2 out of 5 days (2 dives each time), which seemed disappointing to some, but all the other sites we dived in the Sipadan area were fabulous, so no one felt like the missed out. Most boat rides are roughly 15-20 minutes to the dive sites from the resorts of Kapalai and those on Mabul. The resorts usually offer 2 morning boat dives and 1-2 afternoon boat dives. Our resort offered a dawn dive, where we went to Sipadan at 5am and saw the schooling bumphead parrotfish in their nesting spot as they woke up. Night dives are available to resort guests at Kapalai on their house reef as well as the resorts of Mabul on their house reefs. 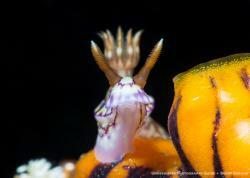 You’re likely to see cuttlefish, mandarin fish, octopus, eels, and hunting lionfish on your night dives. The Ligitan reefs and the island Mabul offer excellent muck diving for those who like those crazy little critters. I’ve seen sea-moths, baby oscillated lionfish, squid, ribbon-eels, flamboyant cuttlefish, broad club cuttlefish, blue-spotted golden rays, hundreds of nudibranchs, mandarin fish, and mantis shrimp on these reefs. It might not look as pretty as the walls of Sipadan, but the life is just as diverse. If you’re looking for wrecks, all you’ll find here are small fishing boats and artificial reefs made from scaffolding at Kapalai and Mabul. These still make great reefs and hiding places for scorpion fish and the like. There’s even a couple of resident giant grouper at Paradise II dive site of Mabul, hiding in the scaffolding structure surrounded by schools of jacks. It’s a pretty amazing site. Sipadan is not the place to go if you want to be along. While diving Sipadan island, you'll have plenty of company. Many of the resorts hold over 100 people. Also, if you want to do macro and night dives on your own for underwater photography, check with the resort to see if they allow solo diving, or if they are a more regimented kind of place where you have to follow your guide all the time. Sipadan also gets lots of beginner divers, so be sure you understand any rules your resort might have. The Ligitan reef system has only one resort atop its sandbar, offering excellent access to these local reefs. 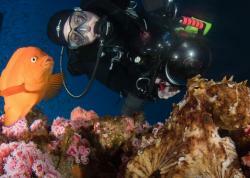 The house reef, also known as Mandarin Reef, is known for the sunset mandarin fish dive. There are a few spots, known by the divemasters, where they vibrantly colored mating pairs of mandarin fish come out to play. Careful though, they’re pretty shy and strobes tend to scare them away. The reef also has plenty other inhabitants to see. Octopus, parrotfish, blue-stripped grunts, eels, lobster, broad club cuttlefish, flamboyant cuttlefish, and plenty damsels cover the reefs. The reef slopes down to about 55’ where you’ll find the artificial reefs of wrecks and scaffolding structures, a great place to find scorpion fish and lion fish. Mantis Ground is one of my favorite sites of all. It is littered with several holes where mantis shrimp live. Not only will you see the giant mantis shrimp, you’ll also see peacock shrimp scampering around the reefs. Another favorite on this dive site is the resident blue-ribbon eel and it’s juvenile (black with yellow ribbon on top) that has its hole about 3 feet below on the reef. Each of my 5 trips here I’ve always seen them. Although our last trip was our first time to Siamil and Danawan Islands, we were pleasantly surprised. Here we found more lusciously healthy reefs with plenty of anthias, frogfish, nudibranchs, leaf fish and strange critters. 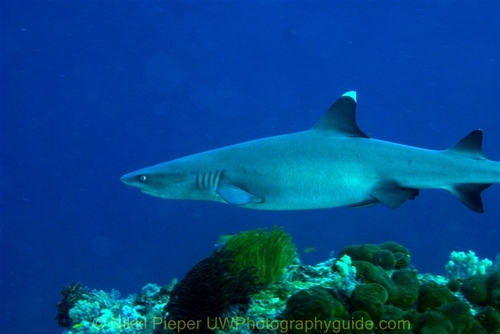 April through October are the best times to dive Sipadan, as the rainy season is November through March. The water temperature ranges from 79-86 degrees year round. I’ve been in August and September and usually had 84 degree water. I always wear a 3mm full suit even though the water is warm. We tend to do a lot of dives over 6-7 days so our core temperature will drop over multiple days. I’ve even worn a beanie halfway through the trip so I wouldn’t get chilled on our hour-long dives, sitting still photographing nudibranchs. Visibility is anywhere from 60-100 feet, less on some of the muck dives. It depends on the weather too, we’ve had the occasional storm come through and cloud up the water a bit, but it dissipates in a day or two. I’ve still had amazing dives even after storms. The life is still there. Sometimes there are strong currents on certain dive sites of Sipadan, such as Barracuda Point, South Point, and Hanging Gardens. It typically goes in the same direction, but I’ve been on dives where it’s headed one way at 100ft and the opposite up at 60ft. The Dive Masters really know the sites and conditions, so trust them, they know what they’re doing and will take good care of you. Getting to Sipadan is an adventure in itself. Malaysia is a long country that is bordered by Indonesia on the south side. At the far easternmost point of the land mass is the large island of Borneo. The northeastern half of the island is Malaysian and the southwestern part is Indonesia. You can fly from into Malaysia through Kuala Lumpur or directly to Kota Kinabalu from most International airports. Once in Kota Kinabalu, you’ll transfer to a local flight to Tawau on the southern tip of Malasian Borneo. In Tawau, you’ll board a bus arranged by your resort, and ride 1 ½ hrs. to the port town of Semporna. This is where you’ll board a boat to your resort. Prepare yourself for the upcoming Sipadan camera ban! It is due to take effect in early 2013. 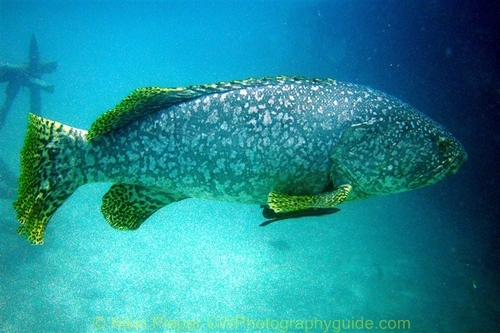 Get there while you can, for some great underwater photos. Or better yet, get a professional photographer permit. Choose your lens based on the dive site. 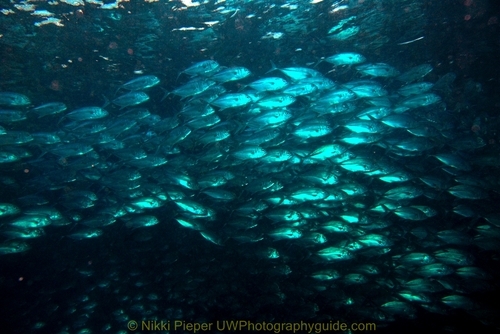 For diving the walls of Sipadan and schools of fish, use the widest you can get. 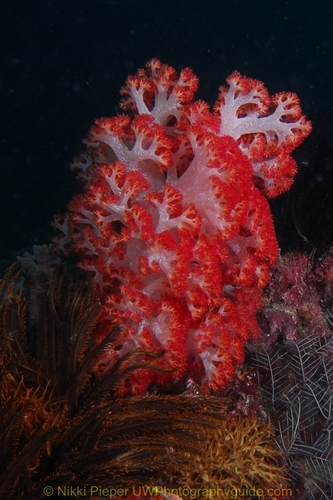 But there are also a lot of great macro subjects on the walls and the reefs at the tops of the walls. I’ve used my Nikon D200 the last two trips shot a 60mm lens most of the time for macro and mid shots. The earlier trips I used a point and shoot with a wide angle lens with wet adapter so I could shoot both macro and wide on the same dive. With your digital SLR, you’ll have to choose based on the site and your preference of subject. Definitely use strobes to get the best color and mood. For Mabul, Kapalai, Siamil, and Danawan, you can shoot mostly with a macro lens, although a wide on some of the walls of Mabul are nice. Make sure you get a good dive briefing before you select your lens. If your going all the way to Sipadan, make sure you do some land touring as well. Visit the jungles of Borneo. Stay at the Sepilok Nature Resort (www.sepilok.com) outside of Sandakan and see the Orangutans next door at the Sepilok Orangutan Sanctuary. They have a wonderful orangutan rescue/release program there. Also visit the Labuk Bay Probosicus Monkey Sanctuary to see some great wildlife. If you are going to spend a few days in Kota Kinabalu, visit the Filipino market for great souveniers. Also take a city tour and learn more about the people of Malaysia. The Hyatt Kota Kinabalu is a great place to stay and they can arrange tours for you. Submitted by Jean Polo (not verified) on Wed, 2012-05-09 14:32. I have never seen that much jacks my whole diving life! What's so special about Sipadan Island is its very rich marine biodiversity, one of the richest in the planet I should say. The underwater scenery is just simply breathtaking and spectacular! And did I ever mention about the barracudas swimming in massive schools as well? Submitted by dennis (not verified) on Mon, 2010-03-29 23:24. 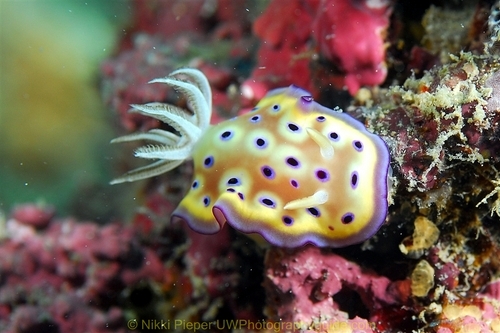 Hi, I would be going to sipadan soon and i was wondering that if I use a LX3, would a strobe still be needed? Submitted by scottg on Tue, 2010-03-30 01:25.